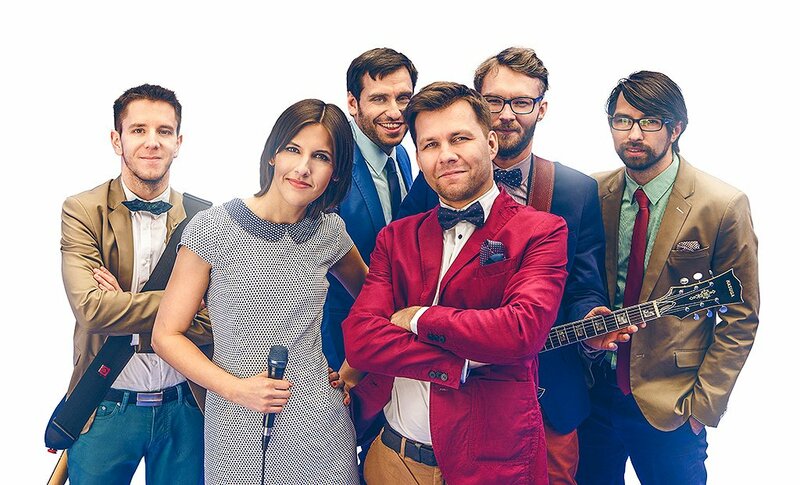 Grajmofon (in 2008-2015 performing as La Lux Cover Band) offers full service musical setting for your wedding, guaranteeing energetic live music and a wonderful time with the greatest hits of all times. Our top-quality sound is a unique combination of various instruments and two vocals: male and female. Our major asset is the possibility of conducting your wedding in three different languages: Polish, English, and German. We only play live music; our instruments include keys, guitar, bass guitar, and funky drums. Such a selection allows us to make any hit sound perfect, whether Polish or international. Our 30-40-minutes sets consist of 7-10 songs and are followed by 15-minutes breaks with background music. Musical sets are always tailored to particular customers, which guarantees 100% satisfaction on their and their guests’ part. Great skills and professional instruments allow us to perform almost every song live, without resorting to half-playback. We believe that live music is the one that really moves people and keeps the dance floor full. From 2008 to 2015 we performed as La Lux Cover Band (www.lalux.pl) and throughout those 7 years did about 200 gigs. We have gathered the necessary experience to please even most demanding customers. The quality of music is the apple of our eye, so we keep investing in the band. That is why our instruments, PA system, and lighting are all top-shelf. We simply play great songs of all times: the 50s, 70s or modern hits, rock, funk or disco – we do not limit ourselves to one style only. That is how we make everybody happy. Unlike many other bands, we opt for two different vocals because we know how boring it can get listening to the same voice for 12hrs non-stop. With a male and a female voice we can offer more different songs in dazzling performances. We are professional musicians who also take part in non-commercial projects, so we are able to blend smoothly a variety of styles. Since we value not the type, but the quality of music, we try to add an extra touch of artistry to the songs that especially need it. How long do you play during the wedding reception? I want my wedding reception to last up to 6 hours, is it possible? During wedding receptions we play up to 10.5 hours from the moment, when the newlyweds came to the wedding hall, but no longer than 3am. There is also a possibility to extend the event by paying the extra fee. We are experienced and we know that, 11 hours is the optimum time for anyone. Actually, we work for you 5 hours longer, considering the time we need to go to the wedding reception place, setting up our instruments (sound test) and packing of our instruments at the morning. We respect our work and we want to give you the highest quality service, so we don’t want to the fatigue change it. You are from Wroclaw. Could you play in other city? Generally we play in Wroclaw and in the area, but we also can play outside this area. We can come for free up to 59km from Wroclaw. Above this range we include in our salary the cost of transportation and the cost of accommodation for our driver. If you have any questions, contact us by phone. How many musicians play in the Grajmofon band? Can I hire the band in smaller line-up? 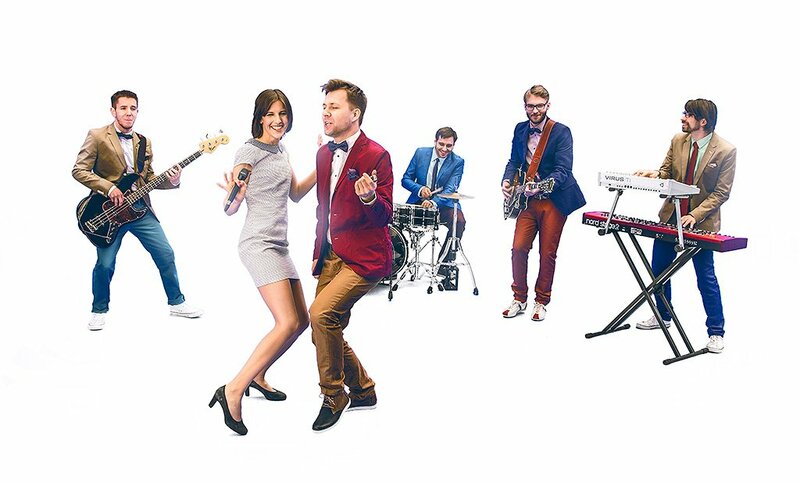 Our band consists of 6 people – 4 instrumentalists and 2 vocalists (one man and one woman). We play only in the full line-up, because the quality of sound and satisfying level of fun may be provided only when all band members play together. Each of us has specific role, that’s way we are the indissoluble whole. Only live music can provide the real fun. The energy that comes from our instruments, tones and engagement make that, our music will satisfy you. We want you to feel the real power of our music. We are ready to meet your expectations, so if you find that we are playing too loud, we will try to play a little bit gently, however it is very hard to mute some instruments, like the drums. We ascertain that, we will accept any suggestion about the level of our music noise. Are you able to play my favourite song? Of course we are! With pleasure we can prepare one special song for you. It can be song for the first dance, special song for your parents or just simply your favorite tune. We have to know about this at least 10 days before the wedding. Do I have to ensure food and drinks for the band (including an alcohol)? We’ll very glad if you provide us food and drinks. We can’t imagine to work so many hours without food and drinks. It would be more difficult to provide the food by our own, order a pizza or leave the hall for a “sandwich”. Certainly it would disturb the organization of our work. We will be very happy to raise a glass to you. You can be sure that, it won’t be a trouble for us to continue our work with passion and responsibility. We would to remind you that, the wedding halls have a special price list for the service and it is worth to use it. How long are the music sets and breaks while playing? We play 30-40 minutes long sets stopped by 15 minutes long breaks, that we need to rest a bit, take some fresh air and quench our thirst. Certainly, your guests will also need some rest, so we always fit to their needs and to the catering schedule. We are perfectly prepared every time, so we will make you satisfy for sure..